"Holidays" A male and a female figure meet on a beach, openly but a little reluctant as if for the first time. A winged letter indicate news coming up, a message from another shore. Palmtree, few white clouds, a mild sun indicate a relaxing natural ambient. 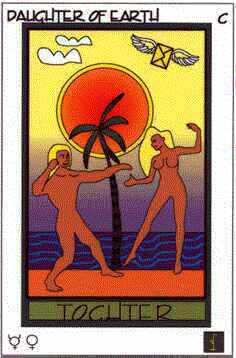 Mercury/Venus: Loving communication, relaxed positive meeting. Theme for contemplation: Relaxing tension. Affirmation: "I am ready to be surprised" Hint: This is it! Keep up this attitude towards life. Those who are on an ever lasting vacation called life have made it. Relaxed in the here-now and still enthusiastic about it. Bravo! "Elemental scientific research" A scientist in a blue collar, indicating field work, watches an aboriginal in full motion. The deeper structures of the stuff the world is composed of is deciphered, using synergy of intellectual and intuitive mental properties. Saturn/Node: Researcher of deep connections, recognized authority, knowledge about the ancient. Theme for contemplation: Separation from the object of perception. 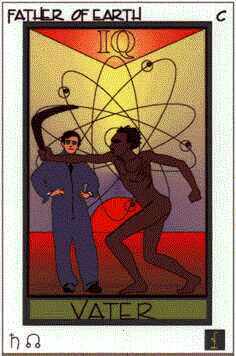 Affirmation: "I am the watcher" Hint: A disassociated point of view helps to see things in perspective. Let go of all subjectivity for the moment. Search for the roots of the issue. 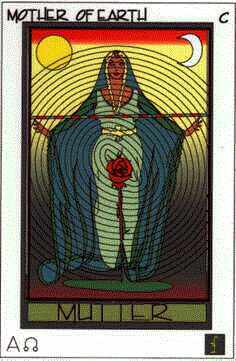 "I am the gate" The perfect mother figure, a rose growing in front of her loins, the source of creative energy radiating into the world. The wand of balance, slightly higher on the left, female, intuitive side. Sun and Moon together. Unending connectedness with her own creation.